The olinguito (oh-lin-GHEE-toe) looks like a cross between a house cat and a teddy bear. It is actually the latest scientifically documented member of the family Procyonidae, which it shares with raccoons, coatis, kinkajous and olingos. The 2-pound olinguito, with its large eyes and woolly orange-brown fur, is native to the cloud forests of Colombia and Ecuador, as its scientific name, “neblina” (Spanish for “fog”), hints. In addition to being the latest described member of its family, another distinction the olinguito holds is that it is the newest species in the order Carnivora―an incredibly rare discovery in the 21st century. Discovering a new species of carnivore, however, does not happen overnight. This one took a decade, and was not the project’s original goal―completing the first comprehensive study of olingos, several species of tree-living carnivores in the genus Bassaricyon, was. Helgen’s team wanted to understand how many olingo species should be recognized and how these species are distributed―issues that had long been unclear to scientists. Unexpectedly, the team’s close examination of more than 95 percent of the world’s olingo specimens in museums, along with DNA testing and the review of historic field data, revealed existence of the olinguito, a previously undescribed species. The first clue came to Helgen from the olinguito’s teeth and skull, which were smaller and differently shaped than those of olingos. Examining museum skins revealed that this new species was also smaller overall with a longer and denser coat; field records showed that it occurred in a unique area of the northern Andes Mountains at 5,000 to 9,000 feet above sea level―elevations much higher than the known species of olingo. This information, however, was coming from overlooked olinguito specimens collected in the early 20th century. The question Helgen and his team wanted to answer next was: Does the olinguito still exist in the wild? The team had a lucky break that started with a camcorder video. With confirmation of the olinguito’s existence via a few seconds of grainy video shot by their colleague Miguel Pinto, a zoologist in Ecuador, Helgen and Kays set off on a three-week expedition to find the animal themselves. Working with Pinto, they found olinguitos in a forest on the western slopes of the Andes, and spent their days documenting what they could about the animal―its characteristics and its forest home. Because the olinguito was new to science, it was imperative for the scientists to record every aspect of the animal. They learned that the olinguito is mostly active at night, is mainly a fruit eater, rarely comes out of the trees and has one baby at a time. 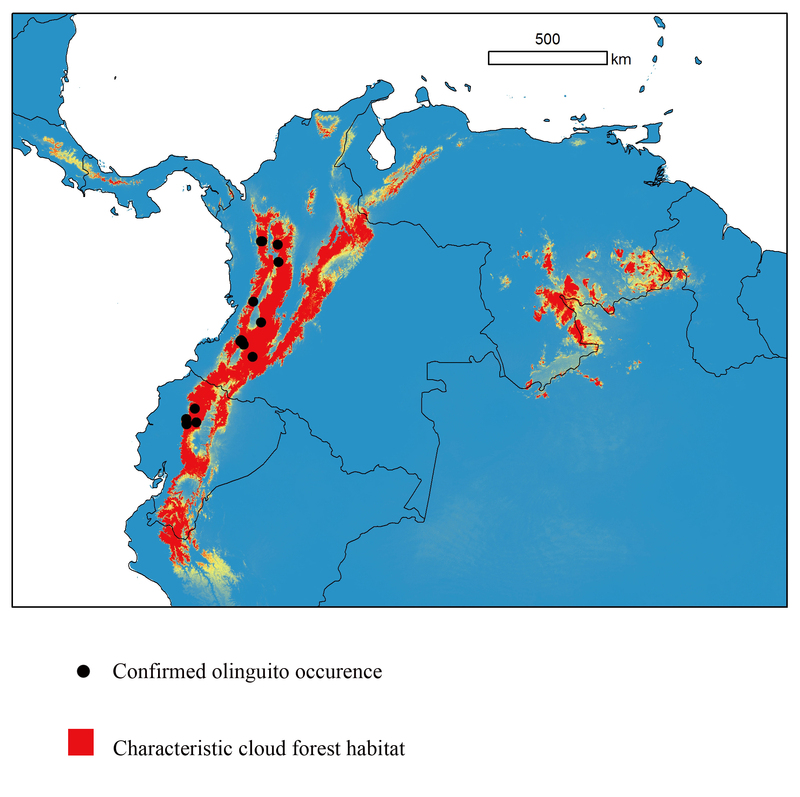 In addition to body features and behavior, the team made special note of the olinguito’s cloud forest Andean habitat, which is under heavy pressure of human development. The team estimated that 42 percent of historic olinguito habitat has already been converted to agriculture or urban areas. 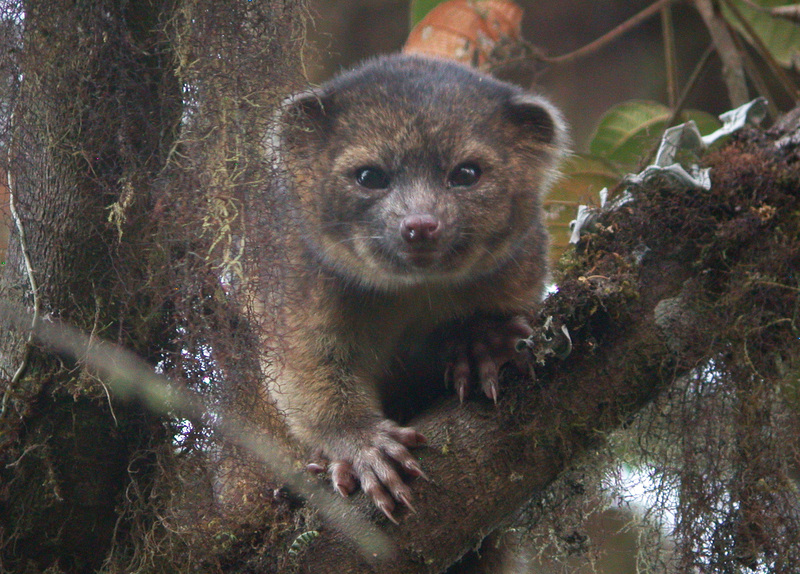 While the olinguito is new to science, it is not a stranger to people. 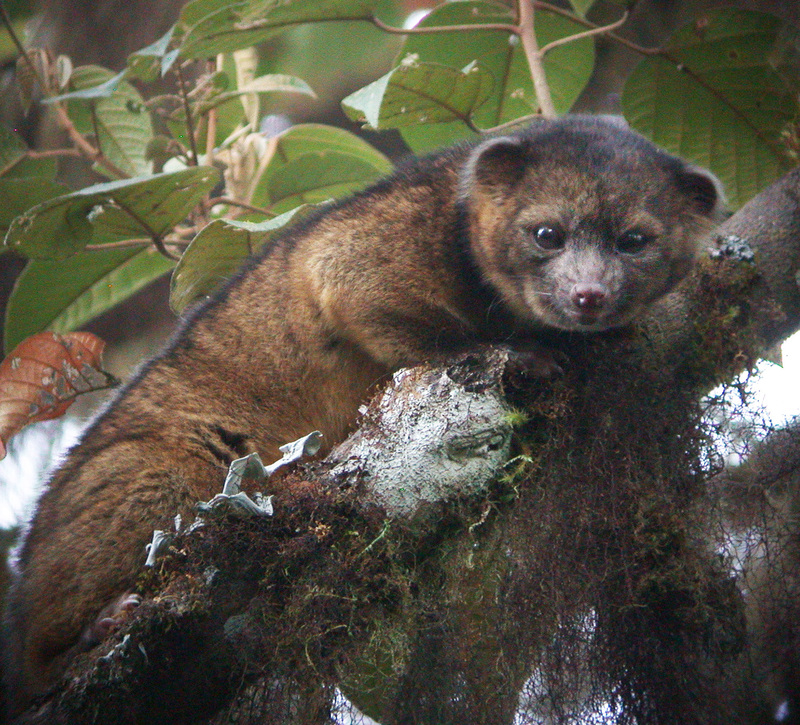 People have been living in or near the olinguito’s cloud forest world for thousands of years. And while misidentified, specimens have been in museums for more than 100 years, and at least one olinguito from Colombia was exhibited in several zoos in the United States during the 1960s and 1970s. There were even several occasions during the past century when the olinguito came close to being discovered but was not. 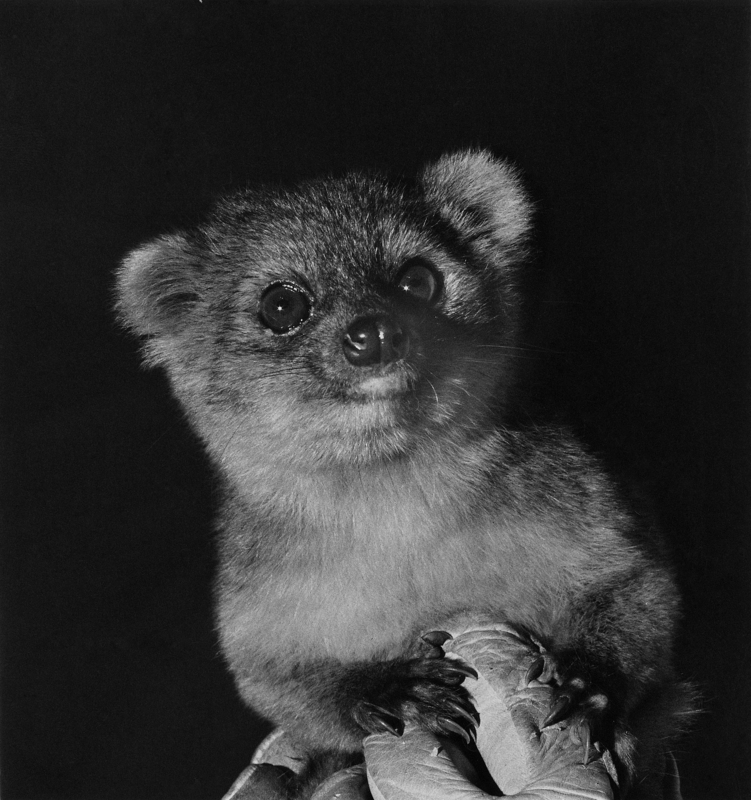 In 1920, a zoologist in New York thought an olinguito museum specimen was so unusual that it might be a new species, but he never followed through in publishing the discovery. 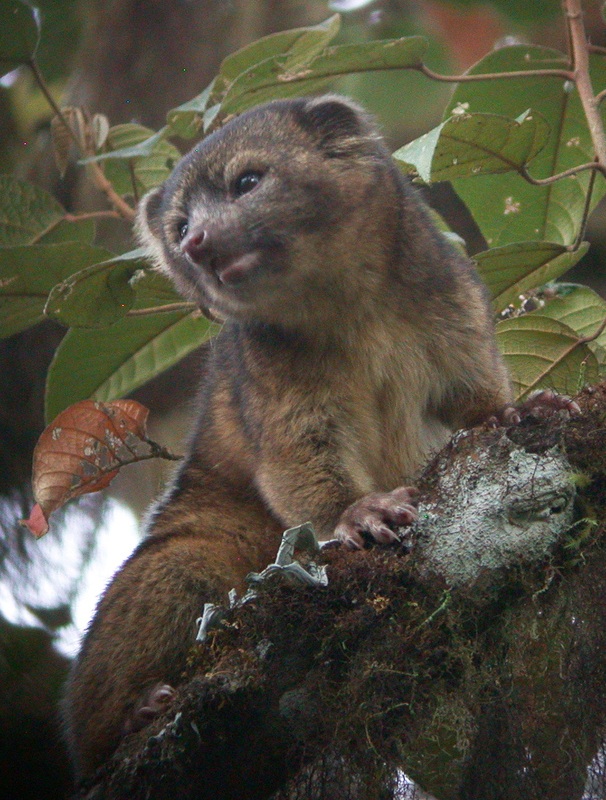 Giving the olinguito its scientific name is just the beginning. “This is the first step,” Helgen said. “Proving that a species exists and giving it a name is where everything starts. This is a beautiful animal, but we know so little about it. How many countries does it live in? What else can we learn about its behavior? What do we need to do to ensure its conservation?” Helgen is already planning his next mission into the clouds.